Is the dream work, the look charming and childlike by elements who will take part. Working with colors and shapes is almost like playing, is being like a child enchanted by the brightness, by the light, by careful assessment of world. And the look distracted the artist is, surprisingly deep, always enchanted by all that the world offers. The work is born of this careful assessment, that twinkle in your eye, the elements that the world presents. Fig. 1 -Drawing scratched on paper, Rosângela Vig. Is this childlike enchantment, fairy tales and castles, who speak my first works, a production of twenty years ago. Even the graffiti, only black and white, these constructs always fascinated me and fascinate me and, Although my dash has changed and evolved, sometimes, the spirit make jokes and wanders through these recesses. And the look distracted and permeates these hidden places, These forgotten times. I did so, more a castle of my childhood tales and make an invitation for a trip to ancient times. For this work I used color pencil on watercolor paper, A4 size. The roughness of this paper can give a nice effect on work. 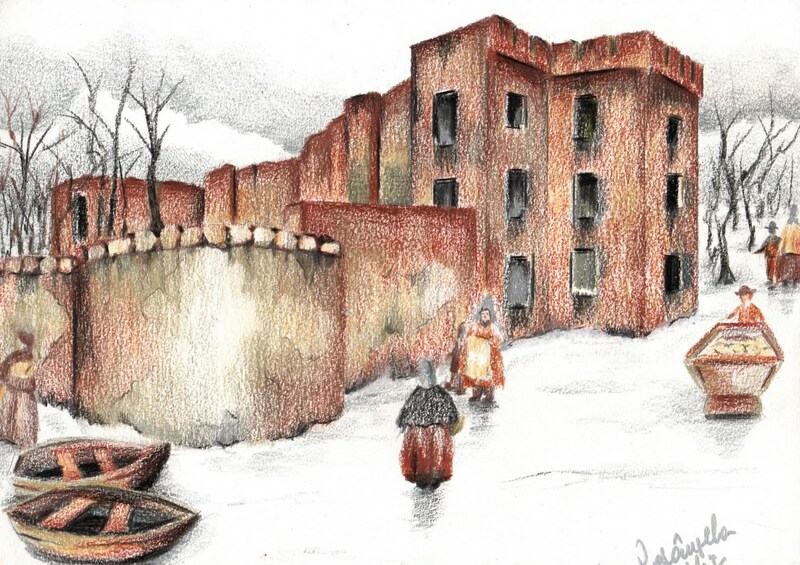 The Castle I imagined, very old, is the period of winter, with a lot of snow. Some people walk, Maybe enjoying a rest of the snowstorm the day before. The boats sleep on the frozen lake and trees, now dry await the first signs of heat, to bloom in new foliage. In the sky, the clouds indicate that the cold did not finish. And it may be that the soul drift for this place. Fig. 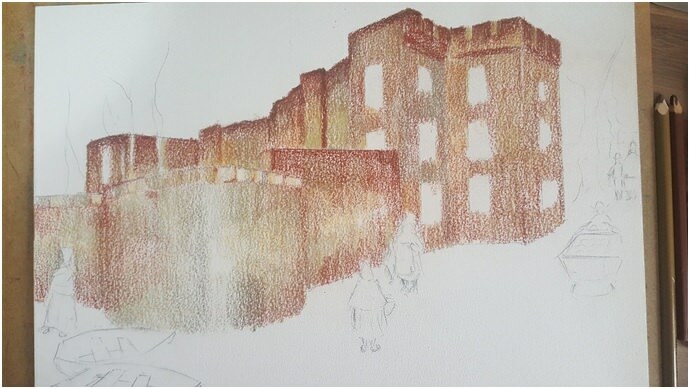 2 -Part of the Castle painted, Rosângela Vig. Imagined and plotted so my scene in scrap paper, quickly and irregular. In the final paper, set down a horizontal line, from which, I went to a few, scratching the other elements (Fig. 1). 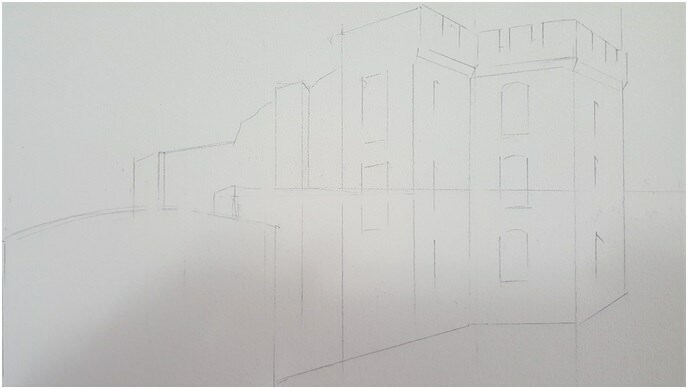 As the castle is being observed on the diagonal, There are two vanishing points, a on the right side, another on the left side. It is very useful to guide all rows that follow in these two directions with a ruler. Everything should decrease to sides who distance themselves from the field of vision. In the case of this work, There are Windows and walls, you need to follow these imaginary lines, for the drawing has depth. Drafted people and boats, take way and without many details. The trees will only be placed, after work ready, for the paint not smearing. With the strokes made in pencil, so the painting began with various shades of Brown, In addition to the black and gray. To emphasize the aging aspect of the Castle (Fig. 2), I searched leave the dark brown in the corners and I cleared my a little more lit areas. But as the original intention was to make a cloudy day, searched not emphasis not in lighting, even in the shadows. Fig. 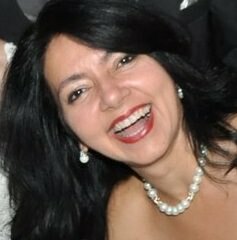 3 -Ready, Rosângela Vig. Not too much in the details of people, Neither of the boats, because the original intention was to suggest traces, do a stylized work and fast. I took the color paper banking, for snow, that is the same color. I just did some risks in grey and black, very smooth, to represent the shadows of people, the boats and the snow. I finished the job with quick and vigorous risks for the trees, always from bottom to top, as the dead wood, without leaves, United only each other, without many details. And let the impressions of inert scene art, the feeling of having walked by that place, having enjoyed the cold harsh; and maybe even have heard the sounds of other times, of people walking, talking. This is the fruition. Fig. 1 – Drawings scratched on paper, Rosângela Vig. Fig. 2 – Part of the Castle painted, Rosângela Vig. Fig. 3 – Castle ready, Rosângela Vig.